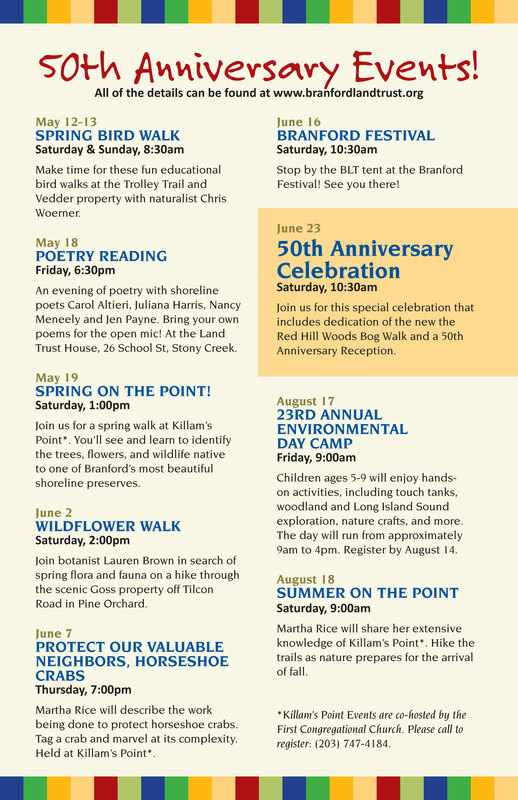 Please join the Branford Land Trust for a special 50th Anniversary Celebration including the dedication of the Red Hill Woods Bog Walk, a guided walk, and a celebratory reception on Saturday, June 23, 10:30am at the Red Hill Woods Preserve in Branford. In addition to celebrating 50 years of successful land conservation and community outreach by the BLT, this event presents the official unveiling of the 1200-foot bog walk, constructed in 2017. 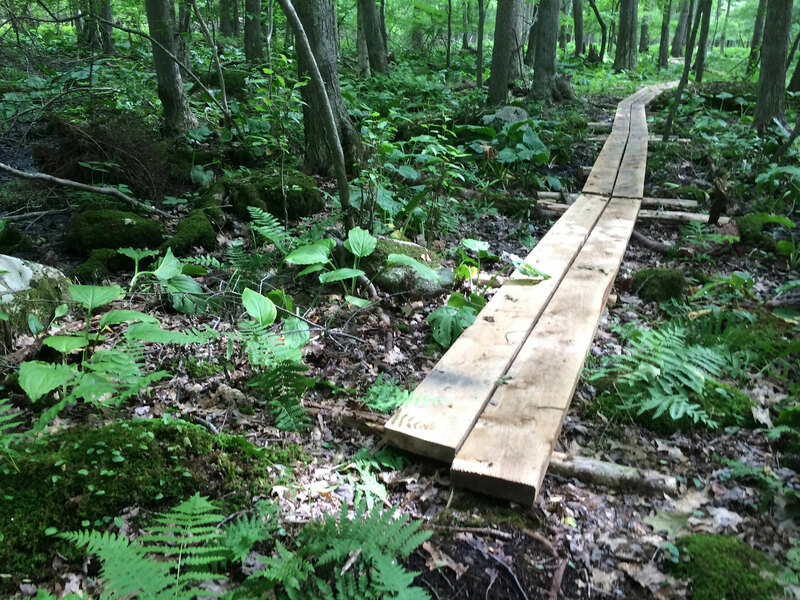 Supported by efforts of the BLT Trails Committee and donations from Ellen Matloff and Mike Bowler, and the Branford Rotary Club, the raised walkway traverses this stunning 29-acre property with views of the tussock sedge-red maple floodplain and adjacent streams. In the spring and summer, this wetland is sunny and filled with clumps of sedges, different species of ferns, and numerous leafy herbaceous plants growing beneath a high canopy of maples and other hardwood trees. Other property features include an upland forest with high ledge outcrops that overlook a vernal pool and a Native American rock shelter. It is a special place, representing the types of open space that have been protected by the Land Trust since its incorporation in 1967. Following an official ribbon cutting ceremony for the bog walk, guests can enjoy a guided mile-long walk through the preserve followed by a community celebration of the BLT’s 50th anniversary featuring educational displays and refreshments. The event will be held rain or shine. In case of rain, the reception will be held at the Branford Land Trust House, 26 School Street, Stony Creek following the ribbon cutting and walk. The 50th Anniversary Celebration is just one of a year-long schedule of anniversary events. Contact the BLT at (203) 483-5263 or info@branfordlandtrust.org for information about this event and schedule changes.